Roasting a pork loin is a really quick and easy way to get a somewhat elegant dinner on the table without a ton of work. It's so simple in fact that I usually like to dress mine up with a crust or some sort of spice rub on the outside. The little added effort makes such a difference in the end result. This recipe is a great one for the start of fall as it makes use of apples and sage in the crust. Dijon mustard is used as a "primer" of sorts to help everything stick to the meat. Variations on this crust are definitely encouraged! Peel and core the apples. Cut the apples into chunks and place in a food processor with the sage leaves. Pulse until everything is finely chopped. Sprinkle salt and pepper over the pork loin. Coat pork loin with the dijon mustard. Spread the apple mixture on a piece of plastic wrap and roll pork loin in the apple mixture to fully coat. Place on a baking sheet lined with a silpat and bake for 25 minutes. Let sit for 10 minutes before slicing. Enjoy! Just popped in from Dine & Dish. I must say, you have a lovely blog and that pork roast looks, well, outta sight! Really nice recipe. Pork with apple and dijon mustard are such a wonderful combination. Again beautiful photos. What a wonderful blend of flavors! I've never tried sage with pork. Goodness knows that I've put it in most everything else. Great idea for dressing up a pork loin! I'm so glad I checked your blog today. My father in law gave us a pork loin on Sunday and I had absolutely no idea what to do with it. This recipe looks so easy! I don't even think I need to get anything at the store! Yum yum yum! And so easy too! Just had this tonight and it was awesome! My kids loved it too. So easy and delicious! I think this would make a great substitution for turkey at Thanksgiving! Yum! 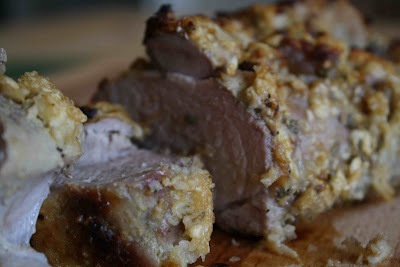 We roast pork loin often, but this recipe is new to me. Thanks for sharing it! Another lovely recipe, I am hungry already!